Fantastic view, confortable beds, super inside warm swimming pool good for the fresh end of the season. The restaurant was good, and for me with some issues of sensitivity to certain food preparations, I had to be careful to choose. The common area and rooms had a lot of windows area, with lots of light. Great Food, clean and nice room with balcony. Good entertainment/Activity. Food & pool were great. Staff were very friendly & evening entertainment was excellent for the kids. nice hotel with option separate own kitchenette and from my perspective it was very nice because I cannot eat regular breakfast that are in a hotel. Close to all main roads, easy to get there and very nice point to comminicate with other points on the island. Very friendly ,helpful staff ,spotless hotel ,lovely selection in the restaurant,fab location ,one mini Ute to the beach front and promenade. Location Location Location. It is not easy to find a cozy spot with access to natural coastal areas in the Island. Friendly and helpful staff + spacey well-equipped room + comfortable beds = a pleasant stay. We have a pet and it costs reasonably 7 Euro upon check-in. Breakfast is great. The apt is very big and comfortable. 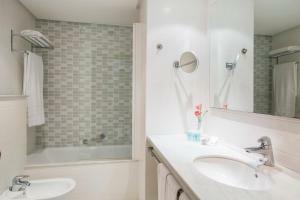 In general, all facilities are good those of the hotel and the apt. The kitchen is well equipped. I really appreciated to have the apt. cleaned every day! The staff are all excellent - especially Kim and Rodrigo on reception. Nothing was too much hassle. Very helpful and friendly. The beds are especially comfortable with proper memory foam mattresses (not just mattress toppers). Place is always spotlessly clean. Very German place and we were happy with that as didn't want to be surrounded by English and Irish holiday makers. Very clean and helpful staff. Beds are comfy and rooms are sizeable. Area is lovely with beach right on door step. The rooms had plenty of living space, and the views the balcony were fantastic! Lock in a great price for Hipotels Bahía Grande Aparthotel – rated 8.5 by recent guests! Hipotels Bahía Grande Aparthotel This rating is a reflection of how the property compares to the industry standard when it comes to price, facilities and services available. It's based on a self-evaluation by the property. Use this rating to help choose your stay! One of our best sellers in Cala Millor! 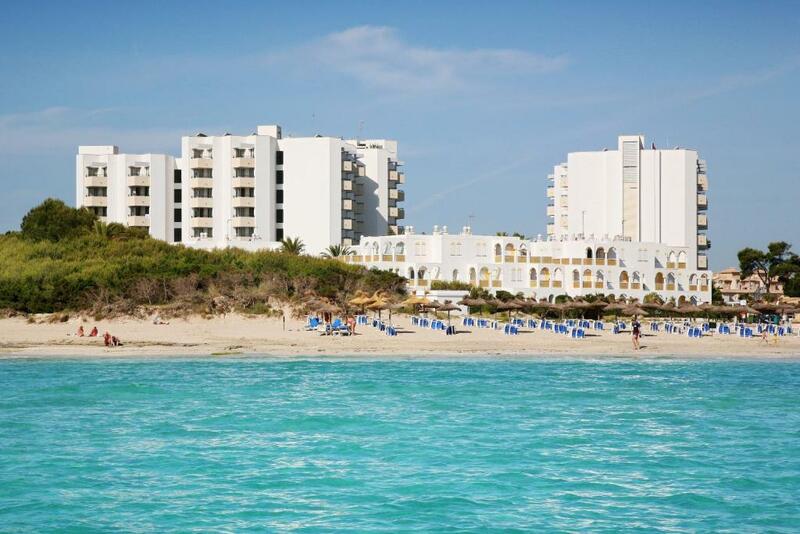 Hipotels Bahia Grande is just 350 feet from Majorca’s Cala Millor Beach. This modern aparthotel offers indoor and outdoor pools, a hot tub and sauna. Hipotels Bahia Grande Aparthotel is a short walk from Cala Millor's shops and restaurants. Glass-bottom boat trips leave from the resort, and a seafront train provides links to Cala Millor and Sa Coma. Each air-conditioned apartment is bright and spacious. Apartments offer a private balcony, a safe and satellite TV. The kitchens include a microwave and a fridge. 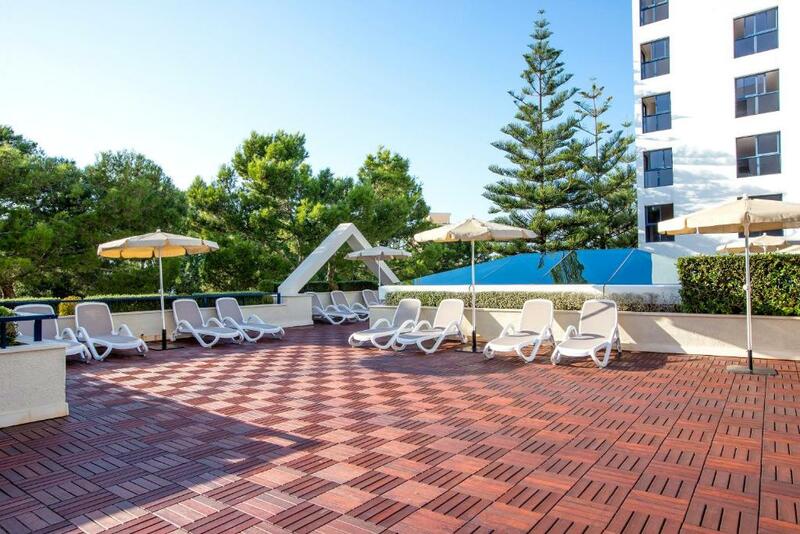 The Bahia Grande has a garden and poolside sun terrace, with sunbeds and umbrellas. There is also a gym, a volleyball court and a play area for children. Activities include archery, bowls and aerobics. The aparthotel’s restaurant serves local and international cuisine. Formal dress code is required for dinner, when men should wear long trousers. There is also a café and a bar, as well as a games room and TV lounge. 뀐 Located in the top-rated area in Cala Millor, this property has an excellent location score of 8.6! When would you like to stay at Hipotels Bahía Grande Aparthotel? This air-conditioned apartment is bright and spacious. There is a private balcony, a safe and satellite TV. The kitchen includes a microwave and a fridge. This apartment has a twin bedroom and a sofa bed. Frente a las cristalinas aguas de la playa de Cala millor, disfrute de las completas instalaciones pensadas para toda la familia. Descanse en el jacuzzi y la sauna o regálese un relajante masaje mientras los mas pequeños se divierten en el parque infantil. Diviértase en familia de los programas de actividades y entretenimiento o practicando cualquiera de los deportes que encontrara dentro del resort, tiro con arco, volleyball, aerobic...etc. Disfrute de la vida nocturna y de las numerosas opciones de ocio que oferece Cala millor. La zona comercial en Cala Millor dispone de infinidad de tiendas, restaurantes, cafeterías, parques infantiles, parque de atracciones , etc. Todo esto lo encontrará a tan sólo 500 m de nuestro apartotel. La zona de Cala Millor se caracteriza precisamente por su seguridad y tranquilidad. Destino ideal para familias y parejas. Tanto el paseo marítimo que discurre frente al mar , como el paseo peatonal interior , tienen una longitud de varios kilómetros hasta llegar al puerto deportivo de Cala Bona, donde también podrá disfrutar de un ambiente muy agradable, lleno de terrazas y restaurantes con vistas al mar. House Rules Hipotels Bahía Grande Aparthotel takes special requests – add in the next step! Hipotels Bahía Grande Aparthotel accepts these cards and reserves the right to temporarily hold an amount prior to arrival. One of the two apartments had an unpleaseant odour of closed humid place, possibly also because air circulation was kept to a minimum to keep warm at the season end. 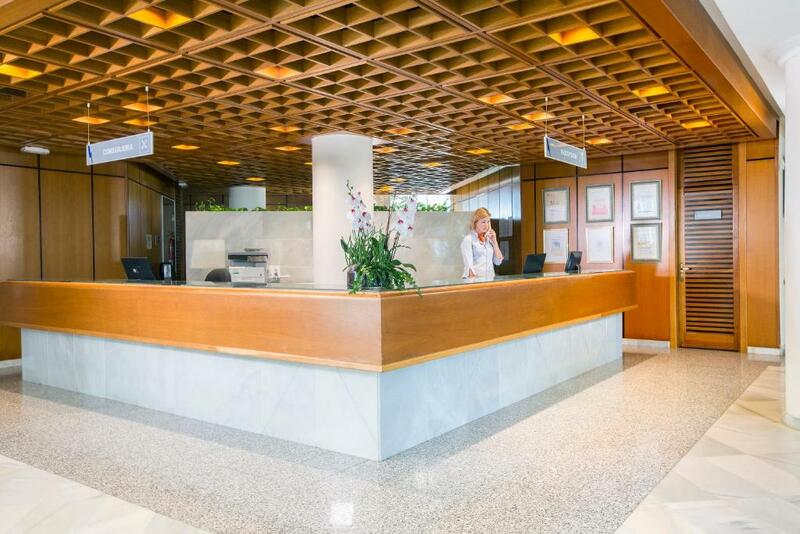 Reception was very kind and helpful and gave a different equivalent room. Unfortunately we were not told about extensive building work on the hotel (building site? )next door .There were really bad fumes coming into the room and bedroom So,obviously we could not sit on the balcony at all in the glorious sunshine due to all the noise and you could smell the strong fumes even with the patio doors shut .The reception staff were very accommodating and arranged another room on the other side of the hotel the next day .If we had been aware of this beforehand we would have had a choice of one of the other group of hotels .I would still recommend the Bahia Grande and would definitely stay there again as everything else is perfectly fine ,especially the pleasant ,helpful staff . It is a buffet restaurant for all meals. Although very diverse and in high quantity, but the quality was not top. Some apartments need a bit of renovation, mine had the bathroom a bit old and damaged (e.g. the door had a shoddy work to keep it working). I didn't know it was in an all inclusive hotel. So didn't know what the rules were regarding food available during the day. I couldn't buy lunch for my 89 year old mother when she needed it. But staff let me have a half a ham sandwich. There is no separate shower in the room. The shower is in the bath which would be fine but I'm pregnant and climbing in and out is a nightmare as there's no non-slip mat at all (which is NOT good even if not pregnant). The pool is very small and very deep. The shallowest part of the pool is 1.2 meters and so not suitable at all for our 6 year old who is a good swimmer but still only little... we had a BIG problem with this and it should be made much clearer when booking that the pool is not kid friendly at all. The indoor pool is closed in summer of course. The breakfast is 12EUR per adult. Very pricey imho especially as it is totally geared towards Germans with cold meats and so on and not very Anglo (no proper bacon, no sausages, etc.) For much better value Biggi's pasteleria across the road does a good breakfast for much better value. The location is right beside the beach (as advertised) but at a part that has poor quality sand and rocky bits and is a 25 minute walk up to Cala Millor itself. So there's absolutely nothing near the hotel except Biggi's and Cristobal (another German place that does decent food and has mini golf). This is not a problem if you don't mind walking 25 minutes to shops and restaurants. Lack of sunbeds and pool area is so small. No atmosphere around the pool, no music. Had to get up so early to reserve sunbeds and no where in hotel open to buy a coffee. Honestly? It was a perfect fit for our family! Pool is very small but beach makes up for it. Food is of a very high standard. Staff very helpful. Location beside the beach is perfect.